Being introduced in 1996, Zhu Hai Jin Ming is a fairly new black tea that originates from Zhu Hai, a small village located in Yixing County, in the southern part of Jiang Su province in East China. Zhu Hai village is renowned for its beautiful scenery and bamboo trees that grow in abundant quantities (its name actually means "Bamboo Ocean"). Although Jiang Su province has been a traditional black tea producing province for many years, none of its productions ever become well-known until Zhu Hai Jin Ming. In year 2001, Zhu Hai Jin Ming won the first prize for the Black tea category in the Fourth China Tea Competition. Some tea connoisseurs even go as far as saying this is the best black tea in the world. This is, of course a matter of opinion but this is a tea we believe you should try if you enjoy black teas. Zhu Hai Jin Ming tea is smooth and mellow, with delicious chocolaty aroma and rich malty flavors. This is an excellent black tea on its own, but also blends well with sweetened milk for added flavor and complexity. Zhu Hai Jin Ming is made of curled, rolled up tea buds. 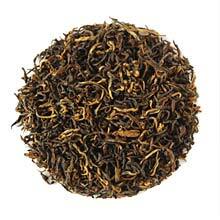 The appearance is similar to Dong Ting Bi Luo Chun but with golden-black tea leaves.